The Automated Juice mixer is a juice mixing device that allows user to create desired drinks with up to four different ingredients through a user friendly interface. Mixing juices can be a very tedious job. We have created a juice mixer that allow user to mix drinks with desired amount and manage their recipes with ease. We use RS232 serial port connection between the computer and our unit so that user will be able to dispense/blend their desired recipe easily. The connection also allow user to upload/download recipes to the EEPROM embedded in the microcontroller. We decide to make a juice mixer after observing many people complaining how tedious it is mixing any kind of liquids. Many people would be happy to see a device that would allow the user to create drinks and manage recipes using easy to understand graphical user interface. The background math has to do with formulating the conversion between the time we open the valves for each of the bottles and the amount of liquid that comes out from the tubes. In order to do so, we need to record the time required to dispense a certain amount for each individual bottles due to the fact that each of our valves are handcrafted by us so that the dispensing rate might vary quite a bit and also due to the fact that we placed the blender cup at the very right edge of our machine and each tubes travels different distance to the cup. The final equation we formulated are based on the test result we use and linearizing them. The diagram above shows our basic design. In our hardware design, signals are sending from the microcontroller unit to each solenoid and motor for dispensing/blending purposes. Much of our effort goes into building the valve and finding appropriate orientation allowing liquid to flow and stop smoothly though our tube. Our software design consists of two parts, a C code that takes appropriate command send via RS232 port. The C code will determine whether to dispense the liquids or store/load recipes to/from EEPROM. The second part of software deal with user interface. Graphical user interface software (BlenderPro) is designed in C#. It allows user to send commands or recipe data through the RS232 port without knowing how it works. 1. Hand-made valves VS pre-made valves. We took our time by doing trial and error while building our valves while we can actually purchase some machine made valves. The obvious advantage is that we save quite a lot of money (around 50 dollars or so) so our budget won��t exceed the limit but we encountered several hardships during our valve implementation. We have made several design changes along the way to compensate for our hand-made valves. 2. GUI VS Simple Command line terminal. In order for user to control our device easily without knowing how everything works, we took our time learning how to write a simple GUI program using C# language. Although it takes much longer than doing HyperTerminal menu display, it makes the whole project look better and more complete. 3. RS232 VS RF. We choose RS232 instead of RF transmitter/receiver since we know how it works already and the C# programming using serial ports are far easier than using RF signals. Using RS232 will not generate radio signals and cause any interference with other people��s project. 4. Spinning Blender VS Shaker. We decided to use a revolving stick attached to the motor as our blender instead of motor that would move the bottle up and down. While the shaker seems like a very nice idea in the beginning, it requires motors with strong torque and by shaking the cup up and down might pour liquid out quite easily. We changed to the spinning stick design based on safety concern and budget concerns. 5. Parallel dispensing VS Serial dispensing. While dispensing the ingredients all at once might seem to be a favorable approach, it requires more power to manipulate and it��s not easy to implement in the lab since we don��t want to use more than one power supply. The circuitry might get really hot if all the valves are turned on at the same time. The only standard we utilize in the final project is the RS232 standard. We transmit the signals through RS232 at 9600 baud with 8 data bits and no parity and no flow control. This will ensure our communication between the GUI and microcontroller unit. We used Poland spring water bottle for our ingredient containers. Poland Spring is a registered trademark by Nestle Waters North America. We also used Tupperware Quickshake as our blender cup. Tupperware Quickshake is a registered trademark by Tupperware Worldwide. Each recipe consists of a string name that is 10 characters long and four ingredients follow by one another. Each ingredient consist of an ingredient code (0 �V 10) follow by 3 digit representing amount of that ingredient. This will make each recipe string exactly 10 + 4*4 = 16 characters long. Depending on how many recipes we want to store, we just append recipes after one another. From the C code, we will only send out the data string after receiving the upload recipes command (v). The data string is always start with * character follow by the number of recipes. The format is almost identical to the download recipes data string except it is started by ��*��. Our C code consists of two parts while utilizing two interrupts. The dispensing algorithm uses the timer compare interrupt to get the exact timing when we want to dispense our liquid. The interrupt occurs every half a second or so based on our setting. The dispensing algorithm allows us to dispense up to four valves serially. The algorithm will determine how many valves to dispense and still be able to dispense them serially. The second part of the C code involves parsing the data string. USART interrupt is used to communicate the blender pro with the C code. The parsing task (machine()) is executed all the time so that it will read any packets in the serial buffer. We use a switch statement to determine what to parse and store the parsing result to EEPROM on our chip. 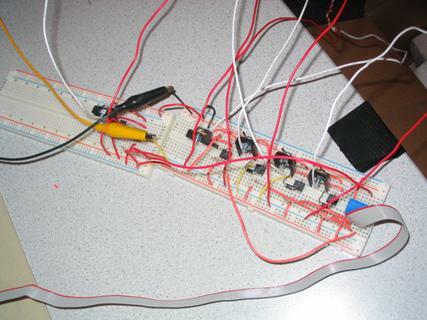 Programming for EEPROM took us a long time to figure out, we had a hard time string to store array of string to EEPROM. Thanks to Greg, who wrote helped us debug and wrote a simple string copy code that copies EEPROM string to strings in memory, we were able to overwrite recipe names in EEPROM. After searching suitable programming language that allow us to implement simple graphical user interface and also communicate through RS232, we decided to implement our BlenderPro program on Visual C# Express 2005 beta. The compiler is free for download on the Microsoft page. 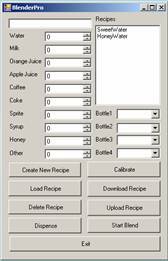 The program allow user to calibrate bottles, create/delete/load recipe and display them in the top left part of the program. The program can also send out command through the RS232 port. All the actions are based on clicking each of the buttons. As soon as the form is generated, we open up the serial port for connection. Calibration and Load Recipe must be done before we can start dispensing any drink. Download recipe is done by first sending download command (l) to the mcu and then start reading the lines in the buffer. This causes us a lot of trouble because it will read anything that��s in the buffer, including the data we send it out. In order to solve this problem, we make sure that the string starting with ��*�� will be the data we want to download. We have also implemented a safety scheme so that the user cannot blend if there is nothing in the cup. The start/stop blend button is implemented as the same one since so that one can only stop the blender after they start it. There are a total of 5 motors utilized in the juice mixer, 4 heavy duty pull type solenoids with built-in springs and also a heavy duty DC motor (both can be operated using up to 24V). The circuit we used was basically the same as the one used in lab 5 (for the DC fan). A uniform 12V voltage source was used for all the motors. Although 12V is well below the optimal performance of the motors, it was selected mainly due our transistors�� limited maximum collector current (Ic max = 3A and the current used for each solenoid was 1.8A). If we stick with a voltage larger than 12V, the transistors connected to the solenoids will overheat really fast and stop working. We could have used transistors with bigger capacity. However, since this situation surfaced in a pretty late stage of the project development, we did not bother to look into getting better transistor. A solution for the transistor overheating was to equip a heat sink on each one of them. On top of that, we also limit the time the solenoids are turned on and not turning them on simultaneously. A lot of time was spent on making the valves and adjusting them. 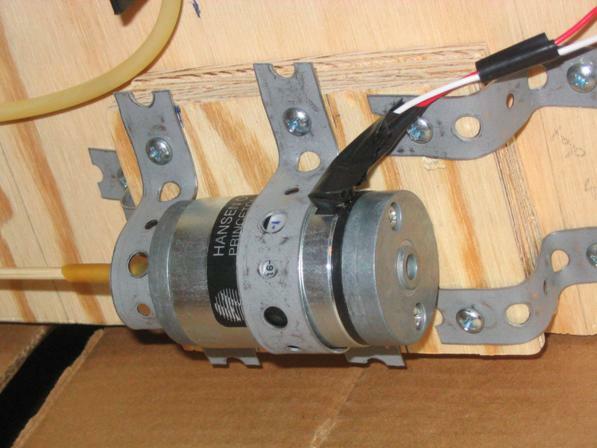 Initially the solenoids we used for valves were a 3-6V mini spring-return push solenoids. This approached did not work for several reasons. First, the solenoid was too weak to shut close any tubing we had (surgical latex tubings with inside diameters of 1/16�� and 1/8��). We tried to minimize the surface area of the solenoid shaft by attaching a dull blade at the tip but it still did not work properly. Plus, the solenoid shaft was also too small to push close the whole diameter of the tubing. Then, we switched to bipolar linear DC stepper motors. This approach was abandoned because we found that they each required an H-bridge and a pulse width modulator to operate, hence, this would require too many components (optoisolators and transistors), which were very limited, mainly because we wanted to make 4 valves. Finally, we decided to change our solenoid to the one we have. The only problem we have with it was that the in order to pinch the valve close we have to build a sturdy sheet of metal for the solenoid shaft to push against with. And since we had to hand-made their quality was not identical. We decided not to position our blender at the bottom of the container, but instead, above the container. It is mechanically easier to build this way and, since we are only mixing liquid, we do not need to put much torque into it. This is also way, we chose to simply use a bamboo skewer with a latex tubing attached at the other end instead of blades. 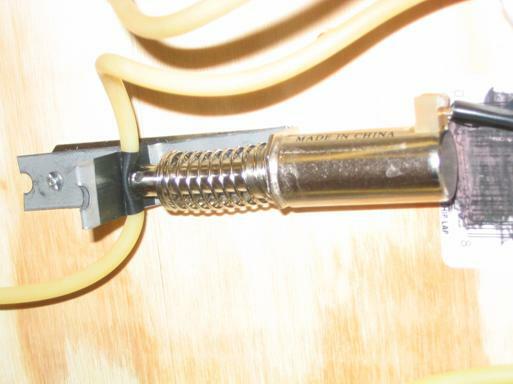 The skewer is also connected to the shaft of our DC motor using a piece of latex tubing. 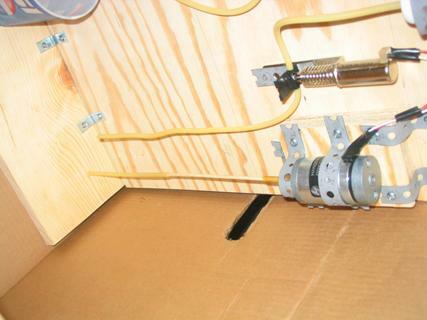 There was never any problem in getting the blender to work since the motor does not require huge current, plus, not much modification was done and none actually affected its functionality. With much of the effort in making the individual valves work, the result we get is quite satisfying. All of the valve dispense and stops correctly and the response time is almost immediate from the GUI to the actual machine. Speed-wise, the juice mixer works really well. As soon as the buttons on in the GUI is clicked, the solenoid shaft retracts and the valve is opened. The same applies for the blender that is operated by the DC motor. Since the timer we utilize interrupts at every half a second, our dispenser can be quite inaccurate. In our tests, the worst case can be 8-10 ml for each 100 ml. We figure this is not a major concern since our mixer is not build for exact amount and missing couple ml here and there will not really affect the taste of the drink we make. Since we were dealing with liquid, our biggest concern in making the juice mixer was to spill liquid in the lab and on our circuit. In order to avoid spilling, we tried not to use too much water while testing and calibrating the mixer. The wooden stand we designed for the mixer also has a space designated for the circuit and the MCU. They can comfortably be positioned at the back side of the system where all the other parts which are directly related to the fluid dispensing system are located safely on the other side. The whole mixer is put inside a huge card box, this way, in case there are any accidental spills, the fluid/water will be restricted in the box. The bottles which contain the juice ingredients are also safely protected from spilling since we taped the bottle cap whenever there is liquid in them. The blender does not have any safety issues, since the DC motor does not require a large current to operate, moreover, it is also always in a sub-par operation with 12V voltage source. Plus, we did not use any sharp objects for the blender. Also note that there might be liquid remain in the tubes and extra care is needed to prevent any liquid to be in contact with the electronic part. The aspect of usability had been in our mind ever since we started designing the mixer. Our aims were to be able to actually use this device in our daily life which is outside of this lab. In order to fulfill this target we tried to make this device operational with any, if not, most computers. This is where our idea of using C# as our main programming language started. 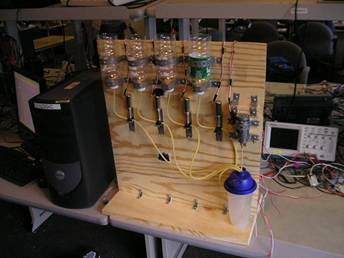 Thus, any computer with a serial port that has Windows .Net framework installed should be able to operate our juice mixer. Plus, by programming in C#, we were able to make a user-friendly interface complete with a nice looking GUI. Overall, we view our juice mixer to be a highly usable device. It is easy to operate, highly automated, and it produces drinks for our daily needs. Although we made several changes during our design cycle, the result we got is actually not bad. Except from a small bug where you have to click on download recipe twice to get the recipes loaded, everything work as expected. Some of the valve we design are not as strong as we hope them will be, but they still dispense and stops the fluid correctly. If we have more time, we would like to implement RF in our control so we can control the machine remotely. We did not use any code from any of the previous projects or anyone else. The C code for microcontroller is modified from our lab3. Throughout our project, we have always place the safety of the user as top priority. We make sure that no electric part will be exposed in liquid or result in any serious injury. 2. To be honest and realistic in stating claims or estimates based on available data. We have achieved in what we stated in our project proposal. The accuracy truthfully reflects the result we got. 3. To reject bribery in all its forms. We did not receive any favor in building this project that would be disadvantageous for other groups. 4. To treat fairly all persons regardless of such factors as race, religion, gender, disability, age, or national origin. The project we designed is suitable for any person who is capable of operate equipments safely and responsively. Anyone who can operate a personal computer should feel no difficulty in operating our machine. Lucas: Provided a workspace for the building of the machine and did most of the construction and hardware debugging.